Our scope of Budding, Grafting and Pruning Knife is mechanically intended to take into account the clients' needs according to modern standards. 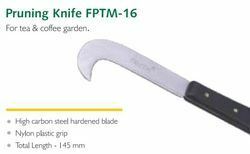 FPK-70 Pruning Knife Designed for tea and coffee gardens. Mahdi Bagh Computers Pvt. Ltd.
- Blade is made of high-grade steel. - Perfect hardened and sharp edge blade. - Very comfortable plastic hand grip.